The past maintains a vibrant presence in the cradle of Western civilization. Atop the Acropolis, the serene Parthenon sails above the commotion of the modern city. The tragedies of Aeschylus, Sophocles, and Euripides were performed in the Theater of Dionysus at the foot of the Acropolis. On Pnyx Hill, citizens of a fledgling democracy gathered to cast their votes on Athens' destiny. Then there is the hustle and bustle of the modern city, a metropolis of 4.5 million that spreads out from the foot of Mt. Lycabettus and across the plain. Packed with busy shops and lively tavernas, modern Athens is a colorful counterpoint to classical Greece. Piraeus is the port city for Athens and has been Athens' port of entry for over two millennia. The greatest of all archeological sites, the Acropolis dominates the Athenian landscape. Ascend 80 steps, take in the views and marvel at such glorious monuments as the Parthenon and the Erechtheum. Under the slopes of the Acropolis, Athens' oldest district features wonderful boutiques, cafes and tavernas. Stroll through its narrow streets, for foot traffic only, and enjoy a plethora of shopping choices. The largest temple in antiquity was 700 years in the making. 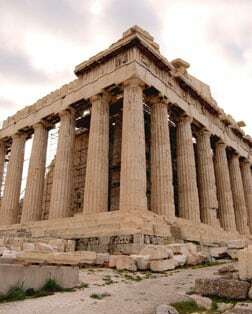 Fifteen of its majestic Corinthian columns still stand, dominating the center of Athens and paying homage to Zeus, ruler of the Olympian gods. Built on the foundations of a 4th-century B.C. arena, this stadium hosted the first modern Olympic Games in 1896 and was used in the 2004 Olympics. World-class collections can be seen at the Museum of the City of Athens, the Byzantine & Christian Museum, the Museum of Cycladic Art, the National Archaeological Museum, Benaki and Acropolis Museums. Built in the 5th century B.C., overlooking the dramatic coastline of Cape Sounion, this cliff-top temple dedicated to the God of the Sea is an imposing landmark for sailors from ancient times to today. "Agora" means "a place of gathering" and this expansive area - the heart of Athenian life and the center of ancient Greek democracy - once served as a marketplace, civic center, and seat of justice. Corinth boasted a forum larger than Rome's shops, fountains and other public buildings, including the massive Temple of Apollo. The Corinth Canal is a 19th-century engineering marvel.